Macademia farmers reap big as prices soar – Kenyatta University TV (KUTV). All Rights Reserved. Few weeks ago, macadamia farmers in Mount Kenya region and especially from Embu County were selling their produce at an average prize of Sh100 per kilo. But today, Kathangu is smiling all the way to the bank as he is selling the same quantity at Sh220, a pleasing increment from the previous price. He is comfortable with the extra price that comes from a kilo of his produce and is optimistic that each kilo will fetch at least Sh300 by the end of this month. Last year, a time like now, the highest bidder was buying a kilo of macadamia nut from Embu farmers at Sh160. “We have been urging macadamia farmers to wait a little and sell their nuts when they are fully mature. The brokers confused them and bought a kilo at between Sh75 and Sh120. Since I am one of those who waited for the nuts to mature, I am selling a kilo at a good price that is increasing per day,” he says. He says he is an experienced macadamia farmer and he has come to master the falling and rising of the prices making him confident when urging farmers to wait until a particular moment. 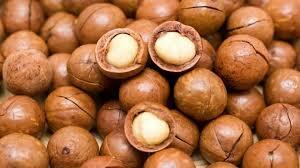 He has 250 mature macadamia trees which are able to produce between 30 and 70 kilos each, per season. Counting with at least 30 kilograms per tree, Kathangu who sells his produce to Jungle Nut Company could harvest 7.5 tonnes—of which—if sold at Sh200 per kilo, he would make a cool Sh1.5 million per season. However, he notes that this year, Macadamia production in the country has gone down indicating that farmers have lost at least 25 percent in comparison to last year’s production. His produce has gone down as well. He believes that for farmers to benefit from macadamia farming, the government ought to allow them sell their produce to their buyer of choice highest bidder. NuTAK has been supporting presence of Chinese traders in the Market, whom members claim offer better prices compared to local processors. Kathangu complains over the new laws set by Agriculture Food Authority (AFA) where they say that before a farmer could be allowed to sell the nuts, he must provide information on the source of the seedlings he planted, quantity of production and permission from the County government. “While I was working at the University press, I understood that I would retire one day and resolved to plant macadamia seedlings which are mature today. I grow several varieties although Mugumo variety is dear to my heart. It produces large and heavy nuts,” he explains. The farmer notes that in order to have matured and quality crop, farmers should start harvesting at the end of March every year saying that harvesting before this time, one destroys yields for future seasons. Early last month, some countries importing the macadamia nuts from Kenya were reported to have rejected the nuts owing to their premature harvesting. Kathangu notes that Embu County produces 54 percent of the total Macadamia Nuts produce in Kenya. Macadamia nuts main harvesting season comes between March and May although some varieties have nuts all year round. He says, unlike many other crops Macadamia nuts farming is not time consuming noting that a farmer can do other works. He notes that he uses the outer nut covers as manure for his trees thus spending very little towards farm inputs. Kathangu advises the Macadamia farmers that they should plant the macademia seedling at a spacing of 7.5m by 7.5m to give them enough space for light and air.